To all our students all over the world. This article section will be used to update you on happenings in our schools. Si fu Paul has written this article to give some of you closure on Si fu Chen passing. I hope in one way it gives you some comfort in dealing with his death. Myself, Si fu Ian and Si sook Marc in Taipei for the funeral and will keep you posted. As you know Master Chen had a heart attack in the morning while hiking in the hills near Ilan. He was found several hours later, as especially during the week there aren’t many people on that trail. Shi Mu and several of the senior students went through to Ilan that evening to identify the body and help carry him back to Taipei. It was a harrowing task for them all to have to see the lifeless body of Lao Shi. Huang Zhi Chang (the dentist) says his posture was typical of the heart attack victim, left arm curled into the chest. He loved hiking , photographing the sunrise, practicing Qi in the early morning, but unfortunately didn’t love resting. If one needs to attach a reason to his sudden death, then it must be because of his relentless lifestyle. He gave classes seven days a week, about 10 scheduled group classes a week to on average 20 students each, on sundays where the Chang Hong Hui classes or the special seminars (qi gong , qin na, sparring) which could be attended by over 80 students at a time. He would travel to Chang Hong schools in other areas of Taiwan regularly to give classes there too, also seminars at companies , hospitals and other organizations. He had numerous private students regularly during the week, sometimes as late as 11 at night, and you could be sure he would be up early the next day to go hiking. An amazing life, a person with amazing dedication and focus, and most of all an amazing sense and connection with the nature of human life and the Qi in the world around us. A true Master of his trade. An artist of the highest acclaim. A teacher who could refashion his theories depending on who the student was and what it was they needed to progress. The gap that he has left in the Chang Hong martial arts system is in one sense devastating, but also as hard as it is emotionally for us to say goodbye to him, we all know how lucky we are. 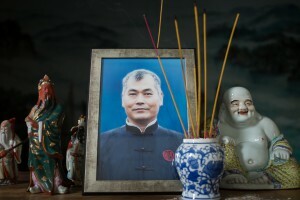 Some Wushu students may anguish at the time of their teachers death that he had taken the inner secrets with him to the grave and not shared his theories. We have quite a different situation. He made plain the theories and principles, the steps to follow and constantly coached us on how to achieve the required feeling. For us the difficulty now is to not languish in the shadow of the great leader as we did before his death, now we have to stand up and put what he taught into practice. We have to each practice Lifestyle Wushu. Wushu as part of everyday life, every movement, every breath, honing habits , focusing intention, attaining stability and balance, and the much sought after sense of Qi. Lao Shi was a great organizer and knew very well that the biggest danger to any martial arts group, was not from outside, but from internal rivalry between brothers. The Chang Hong Academy that he set up has already run for many years steered by a committee with sub groups dedicated to each task, Annual competition, Annual trips and events, teaching, special classes, marketing etc. The 30th anniversary will be held in 2014. The system will continue under the Chang Hong academy, and even the week of his death there was no break in regular classes. The instructors stepped right in and picked up where Lao Shi left off, their constant grooming showing immediately and instructors with good character, a depth of knowledge and a love of martial arts. Lao Shi was not at all afraid of slaying holy cows and challenging traditional taboos. The traditional martial arts world is riddled with the obsession of authenticity, and inferior teachers often lean on the fact of who they learnt from to boost their status. They claim their lineage is authentic and all others are fake. He clearly saw this for the farce that it is and spoke openly about it. From my own experience i can clearly say that my “wushu dream” of meeting great masters, learning secret techniques, the grand fantasy portrayed in martial arts films, after three years of me being in Taiwan was completely shattered, and I knew it for the hollow delusion that it was. A grand disappointment one might say, but on the contrary one is only left with regret if one has desires ,and especially unrealistic desires in the first place. So in my life what remains now is lifestyle wushu, that is what I practice daily from moment to moment, it is how I maintain my body and hone my habits. It is my art which I share and learn and teach with the group, and something that is far more solid than the grand but hollow dream of wushu that I clung to before. We will especially draw on the experience of the elder students of Master Chen who have been with him some as long as 30 years. He often spoke to them about how the group should be run, what was important and what to watch out for. Already there have been reporters hounding Shi Mu for interviews, undoubtedly there will be many old villains appearing out of the woodwork to scavenge a piece of the rich organization that Lao Shi built, but the committee is prepared for all of this. The academy will carry on and grow as Lao Shi wanted it. Putting his ideas into practice. Although undoubtedly many generations might pass before another person achieves the pinnacle of excellence that Lao Shi did, but the frame work is in place to groom and mould them when the time is right. The Chang Hong ideology of The Middle Way of martial arts will continue, naturally ebb and flow overtime, but continue for sure.